For most property investors, your borrowing power is the single most important factor in determining the potential property portfolio you can build. Investors looking to grow large & successful portfolios need as much of the ‘banks money’ as possible. That is why it’s important for investors to understand how lenders calculate your borrowing power. To the naked eye, lender calculators can seem like a giant black hole. Input your income & expense details, and a not so pleasant figure comes out. Digging deeper & understanding how these calculators work can give investors crucial information to help inform their finance strategy. 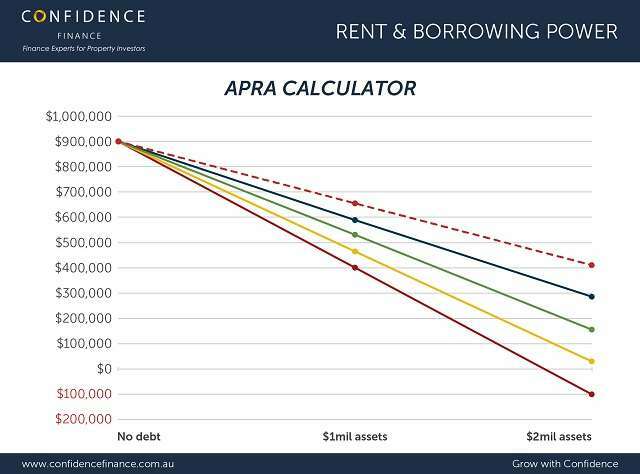 APRA calculators: Most deposit taking institutions lender calculators now follow APRA’s guidance. Middle tier calculators: Some lender calculators deviate from the guidance, producing more favorable results for investors. Aggressive non-bank calculators: These lender calculators do not punish additional debt as harshly. Result 2: Borrowing power falls as your debt sizes rises. 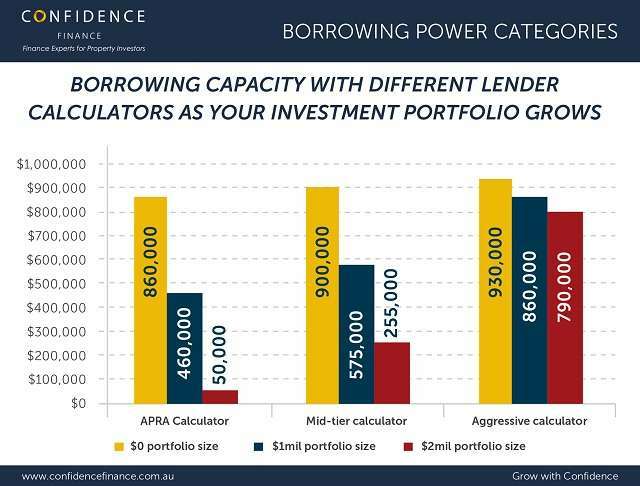 How much it falls by will depend on whether you are with an APRA lender, Middle-tier lender or Aggressive non-bank lender. Result 3: However, the fall in borrowing power is NOT uniform between lenders. That is, every lender reduces their borrowing capacity by a different amount. 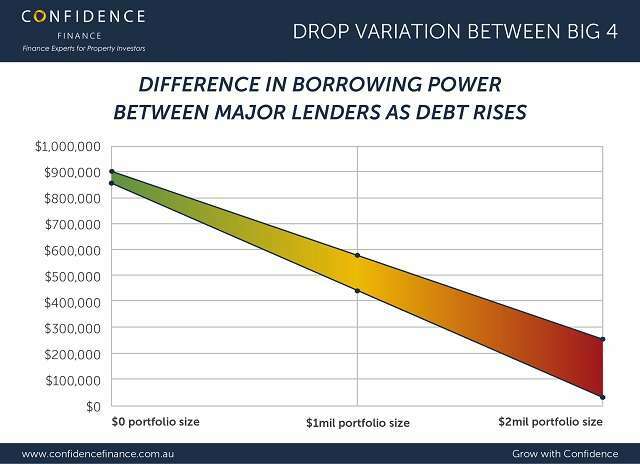 Here is the difference between the best & worst major bank borrowing power calculators for a well-structured $2million existing investment portfolio. Result 4: Income rises are the full-proof way to improve your borrowing power. 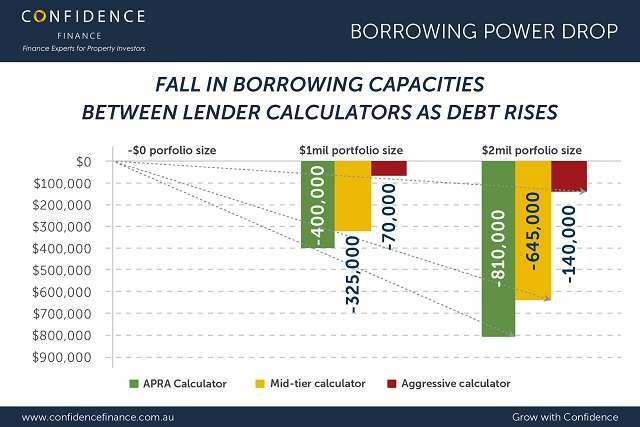 Here’s a breakdown of how your borrowing power will rise with ‘APRA’ lenders & ‘Aggressive lenders’. Result 5: The impact of rental yield is far less powerful today than it once was. 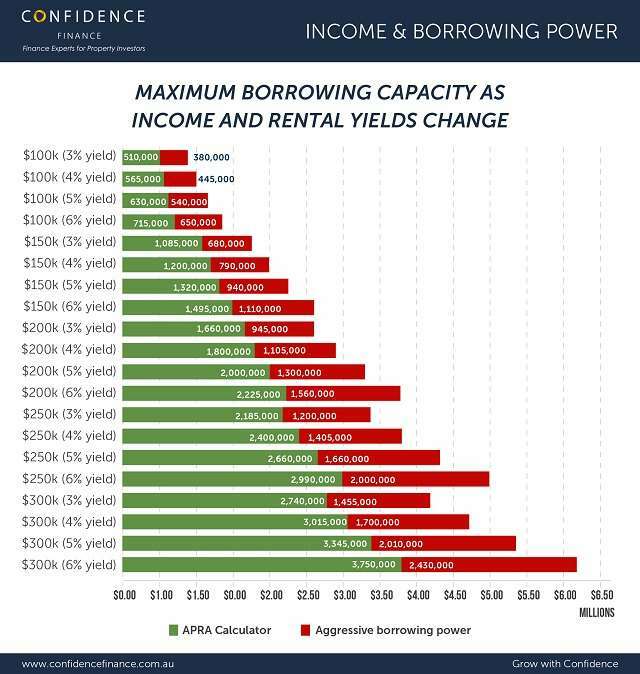 An additional 1 percentage point in rental yield across a $1million portfolio, will only add about $50,000 to your borrowing power. Thinking of becoming a yield investor and hoping to avoid borrowing power hurdles? Think again. The additional yield won’t be able to fund another purchase. Redom Syed is the CEO & Founder of Confidence Finance. He has been recognized as one the Top 100 brokers in Australia and was nominated as Australia’s Best Young Broker in 2017. He has personally settled over $150 million in lending. Prior to becoming a finance specialist, Redom worked as an Economist at Federal Treasury, where he became a published author on the design of the International Financial System.